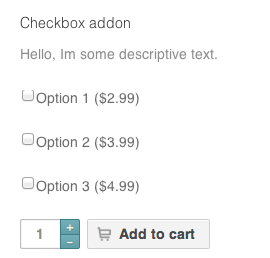 The Product Add-Ons extension allows you to add additional paid (or free!) options to your products using several field types including radio buttons, checkboxes, drop-down fields, custom text inputs and more. This extension also works with the WooCommerce Subscriptions plugin to add additional pricing with your options to the recurring subscription. To create add-ons, use the Create Add-Ons button shown at the top of the screen upon installation. Or go to WooCommerce > Products > Add-Ons and then select Create New. You can add product level add-ons by editing a product. Name: Used to differentiate add-ons from one another, this is not displayed on the website. By default, this is filled in for you. Priority: Specify the order in which to display, if there is more than one add-on activated. An add-on with priority 1 would be above an add-on with priority 10. Product Categories: Set to All products, or choose categories to apply the add-on. Removing the All products tag will deactivate the add-on, which can be handy for seasonal add-ons or time specific add-ons. Click Save when you are done. Next, we’ll cover adding the actual add-ons. Customers choose only one option from a set of predefined options. Examples: Color or size. Title: Format the title as a Label or Heading, or hide it. Display as: Choose how to present options to customers. Display as Dropdowns, Images, or Radio Buttons (see below). Add description: Displays more information about the add-on underneath the heading. Required field: Prevents product from being added to cart if an option is not selected. Options: Add a label for each option as well as a price if needed. Calculate the price as a flat fee regardless of quantity, per quantity ordered, or, charge a percentage of the total. To remove an option row, click the ‘X’. Note: You must add a Label for each option, so the information shows when viewing the order and is passed through in the confirmation email to the customer. If the display option is set to images, an image upload icon will show up next to each option. Customers choose one or multiple options. Examples: Gift wrapping, card, or upgrades. Required field: Prevents product from being added to the cart if an option is not selected. Options: Add a label for each option as well as a price if needed. Calculate the price as a flat fee regardless of quantity, per quantity ordered, or, charge a percentage of the total. Customers can enter a single line of text. Examples: Email address, names, and engraving text. Restriction: Limit the type of characters customers can enter from Any Text, Only Letters, Only Numbers, Only Letters and numbers, only Email Address. Required field: Prevents product from being added to the cart if the field is empty. Limit character length: Specify the minimum/maximum number of characters. Adjust price: Add an additional cost to the add-on. Calculate the price as a flat fee regardless of quantity, per quantity ordered, or, charge a percentage of the total. Customers can enter multiple lines of text. Examples: A gift note, an address, or special instructions. A customer can upload their own file. Example: To create custom designs on t-shirts, mugs, or business cards. Title: The title is displayed above the multiple choice options. You can format the title as a Label, Heading, or hide it. A customer can name their own price, which is added to the total. Example: Donations, tip. Limit price range: Specify the minimum/maximum price. Customers can select a quantity. Example: Used for ordering additional items that go with the main product. Limit quantity range: Specify the minimum/maximum quantity. Use headings to separate your add-ons into sections. Flat fee: Price applied only once, regardless of the quantity ordered. Quantity based: Price is multiplied by the product quantity. Percentage based: Calculates a percentage of the total. You can change the order of add-ons displayed within groups by dragging and dropping. Add-ons can be exported and imported using the buttons when editing a per-product or global add-on. Click ‘export’ to export the existing fields as serialized data. Then click import to paste the serialized data and append them to your existing add-ons. Import and Export are also available for Global Product Add-Ons. Add-ons can be applied to variable products, but can only be defined at the product level. Example: You cannot have an add-on for a specific variation of a variable product — for a blue shirt only. When creating add-ons on a per-product basis, you can choose to exclude all other add-ons that were previously applied to the product. Add-on data is stored to the order line items as meta. View your order to see the chosen values. This can be due to the length of the field name. Try to reduce the field name length or contact your hosting company to increase the value of post.max_name_length. No, Product Add-Ons are made up of complex serialized meta data that would be difficult to do in a product CSV row as plain text. CSV Import can only import meta that is unserialized unless otherwise stated. However Product Add-Ons itself allows you to import and export settings. No. An add-on is treated as an option, not a separate product. Products and their variables have SKUs. WooCommerce Product Add-ons does not have a datepicker. However, we are looking into adding this possibility in a future version of the extension. Add your votes to this idea on the Ideas Board to help prioritize the feature. Note that this code example only sets the value for the Custom price input field to 0 , so make sure to personalize it to your needs. Note: Add-ons can be applied to variable products, but can only be defined at the product level. Example: You cannot have an add-on for a specific variation of a variable product (e.g. for a blue shirt only). Yes. Product Add Ons version 3 introduced a flat fee feature. It might be due to not clicking Save, after adding/deleting/editing any fields. .mo and .po language files for Product Add-ons must be placed in the following path: /wp-content/languages/plugins/. Learn more on translating extensions here. If you are using our Storefront theme, the Add Ons will appear neatly between the short description and the Add to Cart button. However, on many other themes, the Add Ons are displayed beneath the Add to Cart button, which can be confusing for the customer. To change the position, you can overwrite the template structure via a theme. Note that in the case of Product Add-Ons you need to place those template override files into a folder named woocommerce-product-addons in your WordPress theme (instead of placing them directly into the WooCommerce folder in that theme). Is this compatible with Smart Coupons (separate purchase)? Yes, as of version 2.9.0, Product Add-Ons works with Smart Coupons, including the gift card feature. Product Add-Ons does not have support for conditional logic. If you want to show customers different fields based on information they fill out, we recommend that you use Gravity Forms along with the Gravity Forms Product Add-Ons extension. 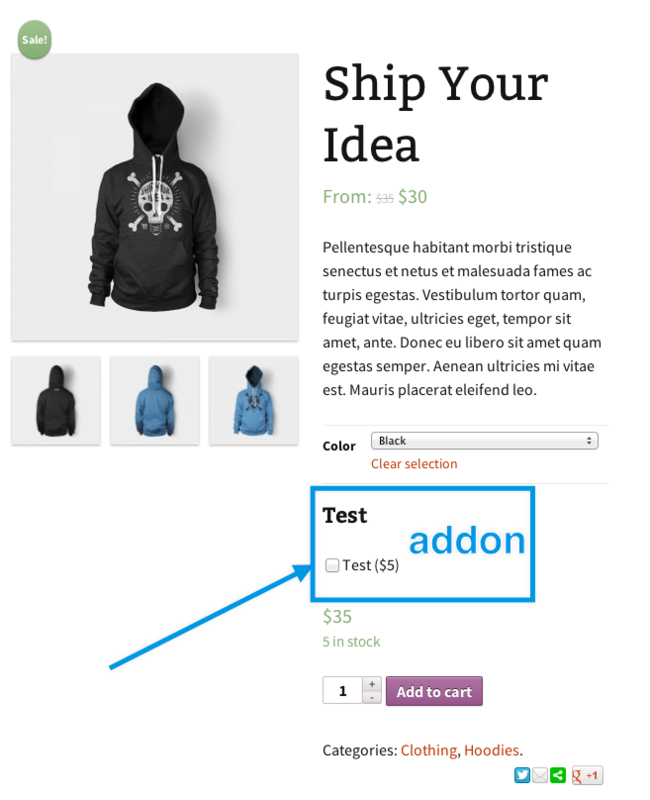 This is currently not possible because WooCommerce Product Add Ons requires the cart and checkout functions. You can submit a feature request for this via our ideas board. Can Product Add-Ons be imported via the Product CSV Import Suite? Can an add-on have a separate SKU for sales/tracking purposes? Can I add a datepicker? How to customize “Grand total” and “Options total”? How can I set default input values? Can I add custom fields to variable products? Can I have product add-ons applied once to the product, no matter the quantity ordered? Why are my add-ons blank? Where do I place my language files? How can I change the position of the add-ons on my product page? Does Product Add-Ons allow me to use conditional logic? Can I add orders via the admin backend with Product Add Ons for phone orders?